Propolis has been used in the traditional medicine for more than 2000 years. It is a treasured medicine due to its antifungal, antiviral, antitumor, immunomodulatory and anti-inflammatory properties. Additionally, due to its antibacterial and antioxidant activity, propolis is a potential candidate for “green” synthesis of nanoparticles (NPs) or/and composite materials with potential medical applications1. Hence, the aim of the present study was focused on biogenic synthesis of gold and silver nanoparticles with propolis extract. A commercial Bulgarian poplar propolis extract was used. The composition of the extract was investigated by GC-MS. The synthesis was followed by visual observations and UV-Vis studies. The morphology and characteristics of the NPs were determined by transmission electron microscopy (TEM). Both, gold and silver nanoparticles were successfully obtained in situ in a simple, one stage process, with the propolis extract. Compared to plant extract from Rosa damascena waste (able to reduce the Ag+ and Au3+ in 2-3 minutes), the visual process of synthesis took 120 and 3 minutes, for silver and gold nanoparticles, respectively. The TEM studies confirmed the АgNPs and AuNPs synthesis with Bulgarian propolis extract. The GC-MS analysis revealed that the propolis was rich in flavonoids (pinobaksin, pinocembrin, chrysin, quercetin, kaempferol and their derivatives). The present study clearly demonstrated the potential of propolis extract for “green” synthesis of gold and silver NPs. Acknowledgements: We acknowledge the financial support from the National Science Fund of Bulgaria; project DN 17/22 “Valorization and application of essential oil industry wastes for “green” synthesis of metal nanoparticles”. 1. Matei PM, Martín-Ramos P, Sánchez-Báscones M, Hernández-Navarro S, Correa-Guimaraes A, Navas-Gracia LM, Rufino CA, Ramos-Sánchez MC, Martín-Gil J (2015) Synthesis of chitosan oligomers/propolis/silver nanoparticles composite systems and study of their activity against Diplodia seriata. International Journal of Polymer Science Article ID 864729, 11 pages, http://dx.doi.org/10.1155/2015/864729. ISNAD SLAVOV, Anton M. , KARASHANOVA, Daniela , GEORGIEVA, Biliana , VASILEVA, Ivelina , BANKOVA, Vassya , DINKOVA, Rada , YANTCHEVA, Nikoleta . "“Green” Synthesis of Gold and Silver Nanoparticles with Propolis Extract and Rosa damascena Waste". 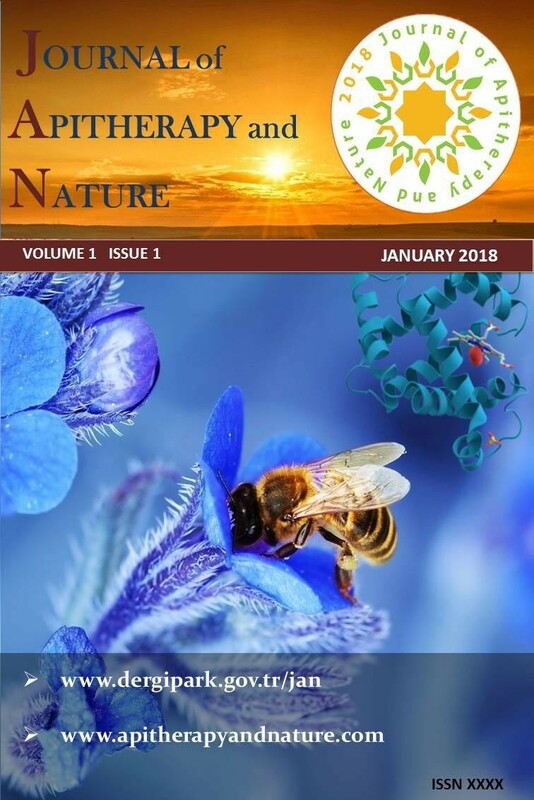 Journal of Apitherapy and Nature 1 / 3 (December 2018): 71-71.